At some point soon, likely within the next week, Greg Bird will return from his ankle surgery and join the Yankees. The Yankees love love love Bird and he is expected to step right in as the everyday first baseman. It would not surprise me at all to see him hitting third or fourth in his first game back. The first base position has not been a total disaster during Bird’s absence. Neil Walker has been really good this month while Tyler Austin has crushed lefties all season. Even after going 0-for-Hamels last night, Austin is hitting .293/.362/.634 (163 wRC+) against southpaws this year. He has been an objectively great platoon bat. Moving forward with a Bird/Austin platoon at first base sounds simple enough, though roster spots are a finite resource, and the Yankees may not be able to carry two first base only guys. And, as good as he’s been, sending Austin to Triple-A when Bird returns is the most logical move, for three reasons. 1. The Yankees aren’t scheduled to face many lefties. Pitching plans can always change, but right now, the Yankees are scheduled to face two lefties over their next 15 games. They’ll see Andrew Heaney this weekend and Dallas Keuchel next week, and then it’s a long run of right-handed pitchers. Again, pitching plans are tentative, but that’s how things are set up at the moment. Austin shouldn’t be in the lineup against righties. Not over Bird. And, with so many right-handed pitchers coming up, Austin is going to be glued to the bench. Yeah, I suppose he could be a pinch-hitter option against a lefty reliever, though those opportunities may be few and far between. Simply put, it doesn’t appear there will be many at-bats for Austin in the near future. 2. The Yankees are going to carry an eighth reliever. Like it or not. I don’t like it, but there’s nothing I can do about it. The Yankees will start a 14 games in 13 days stretch Friday — hey have the makeup doubleheader in Detroit coming up — and I would bet heavily on the Yankees carrying an eighth reliever during that stretch. They like having the eighth reliever. It’s been made clear. Who will that eighth reliever be? It might be Jonathan Holder once Tommy Kahnle and Adam Warren return. The identity of the eighth reliever is irrelevant. As long as the eighth reliever is on the roster, there are only three players on the bench. Austin Romine and Ronald Torreyes will be two of them. The more versatile Neil Walker makes more sense for the final bench spot than another first baseman. Walker in MLB and Austin in Triple-A is better than Austin in MLB and Walker out of the organization. 3. The sooner he goes down, the sooner he can come back. By rule, players sent to the minors have to stay there at least ten days before being called back up, unless they’re replacing a player placed on the disabled list. So, the sooner the Yankees send Austin down, the sooner the clock starts and the sooner they’ll be able to bring him back as a platoon option should they run into a bunch of left-handers or something like that. Odds are Austin’s assignment to Triple-A would only be temporary. 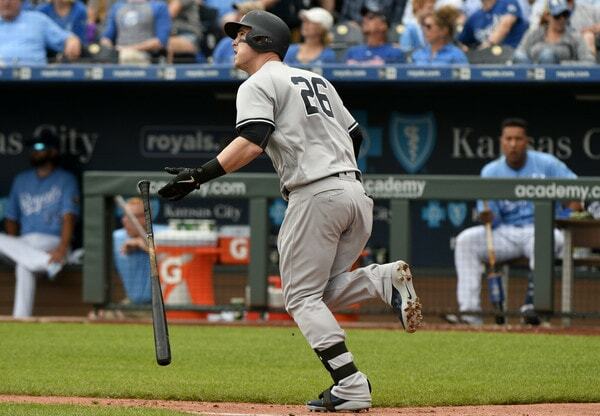 It boils down to this: The Yankees have too many good players. It sounds silly and it is, but it’s absoluty true. Clint Frazier and Brandon Drury should be in the big leagues. So should Adam Lind. Holder has looked pretty good lately and deserves to stay in the big leagues, but might get pushed down when Kahnle and Warren return. The Yankees have an incredible amount of depth right now. Austin doesn’t deserve to be demoted. He’s performed about as well as anyone could’ve possibly hoped so far this season. Given the roster though, carrying another full-time first baseman doesn’t make sense once Bird returns. The Yankees are going to carry an eighth reliever, which leaves them sort a bench player, and there aren’t many left-handed pitchers on the upcoming schedule. A righty platoon first baseman isn’t the best use of a roster spot. These roster logjams always have a way of working themselves out. Bird has had plenty of trouble staying on the field lately — Austin himself as an injury history too — and it is entirely possible an injury elsewhere on the roster will create an opening. Given the current roster, it’s hard to see how both Bird and Austin fit, even with Boone saying there is potentially a role for both of them.